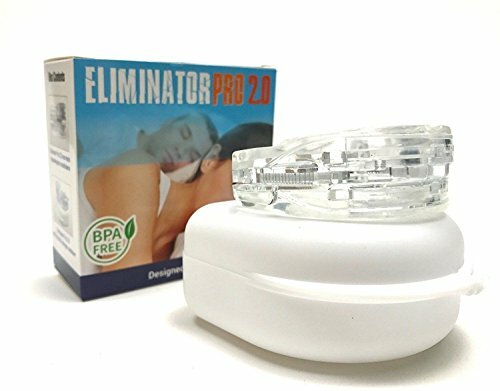 Hot off the engineering block, the Eliminator PRO adjustable Bruxism Mouthpiece is the most advanced and effective product on the market. With a smaller overall size than the competing brand, and even smaller than the original Eliminator, the Pro model is more comfortable than ever before. The ELIMINATOR PRO MOUTH GUARD works well because it can be adjusted to the desired setting for the user's mouth. This amazing lock technology helps you from clenching and grinding your teeth at night. The problem with mouthpieces on the market today is that they have only one setting to re-position your mouth and they are one solid piece that can usually mold to your mouth, but they can not adjust for your personal requirements. The ELIMINATOR PRO MOUTH GUARD has 10 incremental, 1 millimetre, possible adjustments. Some people will need to increase or decrease incremental adjustments over time to fit with the natural overbite or under-bite, it can be set to your comfort and effective level - this just is NOT possible for any other mouthpiece on the market. The ELIMINATOR PRO MOUTH GUARD has all the great functionality of the original ELIMINATOR, with the critical added feature of being able to adjust the mouthpiece according to your personal requirement. Not for small mouths: Height at front 1.09", height at rear .8", overall depth 1.65", widest point 2.63"
If you have any questions about this product by Eliminator, contact us by completing and submitting the form below. If you are looking for a specif part number, please include it with your message.